I love Women’s History Month — for a variety of reasons. For one thing, I like learning about and celebrating the accomplishments of women. 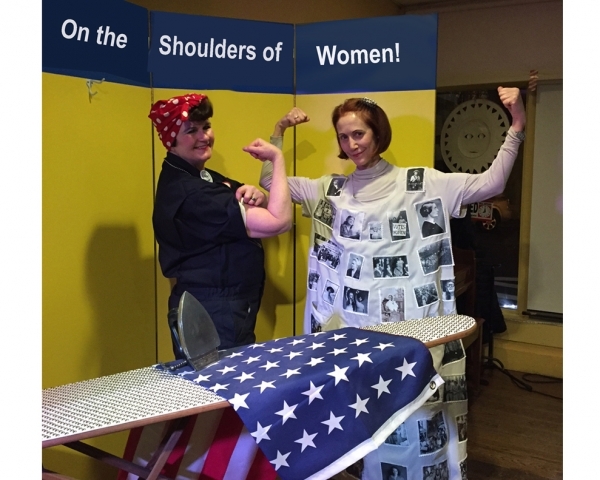 In 2016, Carla Rae Johnson afforded me the opportunity to share my research on the amazing Lowell Mill Girls, the first generation of American women workers to band together in order to stand up for their rights. 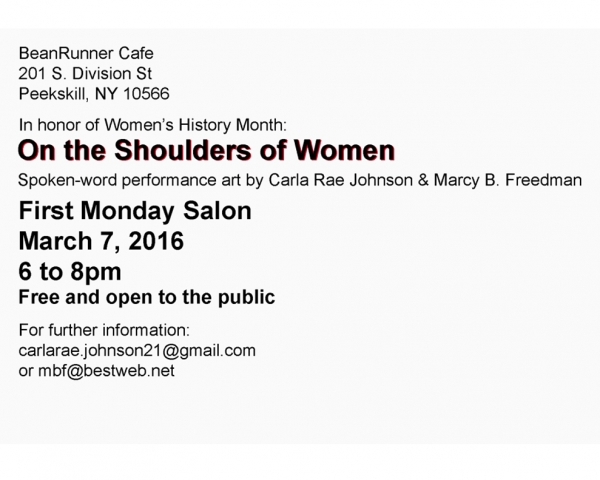 Carla Rae and I put together a program called “On the Shoulders of Women,” and we presented it for a crowd of folks at a local cafe. I took the stage first, assuming the role of Sarah George Bagley, one of the most infamous of the Lowell Mills Girls. I used slides to enhance my spoken-word performance, demonstrating the ways in which the actions of Bagley and her colleagues in the first half of the 19th century set the stage for future feminists, such as the Suffragists and Women’s Libbers. Then, Carla Rae appeared as Rose Bonavita of Peekskill, who worked on the assembly line building airplanes during World War II. After training to be a riveter, she became known as “Rosie the Riveter” for breaking records with her skills. Eventually, she came to symbolize the thousands of women who held the country together doing work they had never done before. The confidence these women gained on the job changed their relationships to home and family and paved the way for the Women’s Movement of the 1960’s and 70’s. It was an honor and a pleasure for me to be a part of this important evening of informative entertainment!